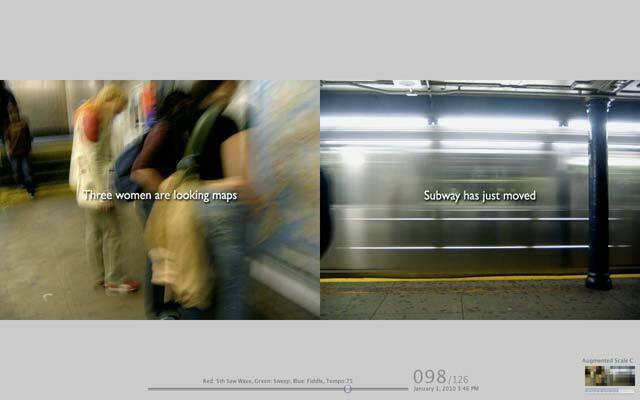 There are two versions of this project which are Full Screen Installation and Web Browser. Web browser version requires revWeb plugin (free). Please install it on your browser before you open the project pages. 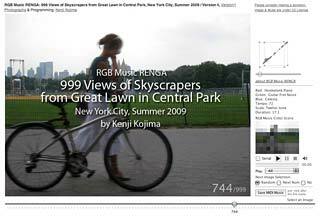 RGB Music RENGA is an algorithmic composition. It creates about 10 to 60 seconds of compositions from RGB (Red, Green, and Blue) pixel value of a series of photographs. The program reads RGB value of pixels from the top left to the bottom right of an image horizontally. One pixel makes three notes of sounds, and the length of note is determined by high or low value of the pixel. RGB value 120 or 121 is the middle C, and RGB value 122 or 123 is added a half steps of the scale that is C#. RGB value 0,0,0 is no sounds. It is not an impression of a painting or a photograph of a musical variation. It composes a score from an image directly. The music is not a recorded file. The music is an improvisation by the Web software. Total number of pixels, tempos, scales and instruments are changed in every each session. The basic conversion from RGB Value is a twelve-tone scale music, then it is filtered to another scale. R, G and B values are assigned to an instrument from 123 different instruments. These musical elements, the number of the photograph and the performance date and time are described at the bottom center or the right column. The color score of mosaic (chart of pixels) and XYZ mapping score are shown in the right column. 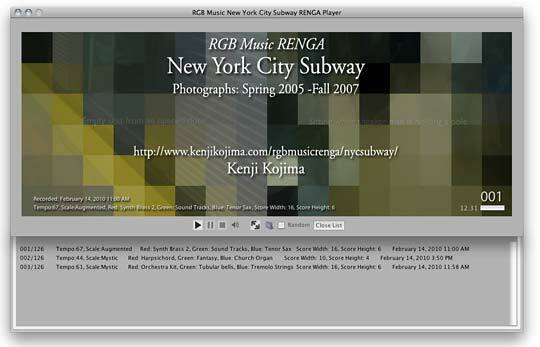 The project title "RGB Music RENGA" was taken from a form of RENGA. RENGA is continuing short and collaborative poetry in Japan. The beginning of lines of a RENGA became HAIKU (a poem of seventeen syllables). A series of everyday life scenarios of photographs was inspired by Hokusai's Thirty-six Views and One hundered Views of Mount Fuji. 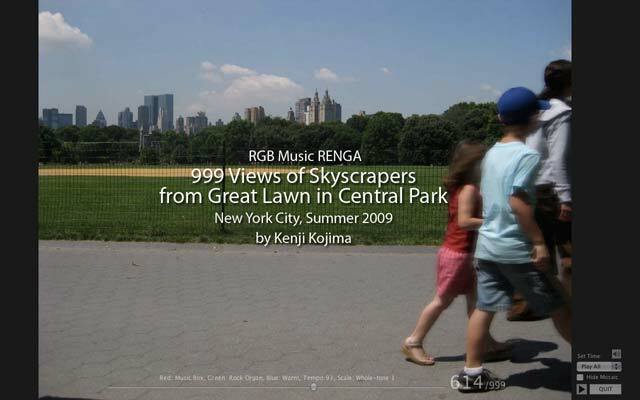 The concept and the method of RGB Music RENGA. It was gathered Kenji Kojima's sound art studies and made an application. MacOS and Windows. Freeware. This is real time algorithmic compositions by Web application. Web browser and Installation versions are same algorithm. This is real time algorithmic compositions by Web appli.